SQL & XML GURU Mr. Jacob Sebastian has real passion to reach more and more IT person to help them in Microsoft technology. I always appreciate him for his endeavor efforts to help community. Jacob has started new forum “ASK” under BeyondRelational.com where you can ask question directly to the industry experts. There are many experts available there for various subjects like TSQL, XML, ETL, SSIS, SQL Server, .NET, DBA, performance tuning and many more. 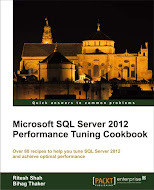 If you want to ask me any SQL Server related question, feel free to ask at following link. You may find many forums regarding all topics I have mentioned above, the main advantage here is, you can directly ask to experts rather than raising question in other forums and wait for somebody to look at your question and answer it. So, what are you waiting for? Register in beyondrelational.com and ask question which is giving you sleepless night. I have one excel workbook named 'reports' with 5 sheets like Sheet1,Sheet2 etc. The excel sheet is in 2007 format. All the fields in the sheets are same with different records. I want to import all these 5 sheets to a single SQL table without using SSIS. I am using Microsoft SQL Server Management Studio 2008. Please help me with the query. Thanks for your posting your question here but this is not the right place to ask. I have my personal forum where people come and ask me question at following link, can you please post your question there?